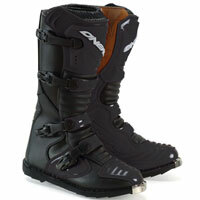 These sturdy, stylish Element racing boots are brought to you by O'Neal. Known for their quality products they've gone one better and created these boots with a new and improved ultra strong buckle system, and as always, are fully adjustable for a snug, custom fit. The boots are genuine leather, feature a molded rubber heat shield and injection molded shin plate for safety - all with full plastic protection to boot. O'Neal's Element Boots have a super strong uni-directional sole and steel shank for stability and strength. Great boots don't have to have a great big price tag - these boots are proof of that.